MAHATHIR was continually upset with the Judiciary because the verdicts in a number of cases went against the Government. According to then Deputy PM, Datuk Musa Hitam, one of his favorite slogans was "Hang the Lawyers! Hang the Judges!" From 1987, he intensified his verbal attacks against the Judiciary in the news media, making damaging statements which clearly demonstrated that he did not understand the role of the Judiciary as being independent from the Executive and Legislative arms of Government. That the Judiciary exists as a check-and-balance against the excesses of the Executive appeared to have been a concept he never fully grasped. Instead, he accused judges of the sort of political interference that would result in confusion and loss of public confidence in the Government. Hence, to curtail the powers of the Judiciary and subsume it beneath the Executive became one of his cherished dreams. In April 1987, after an UMNO leadership contest in which Mahathir very nearly lost to Finance Minister Tengku Razaleigh Hamzah, there were allegations that several delegates who had voted were drawn from branches not properly registered under the Societies Act 1966. An appeal was filed by eleven UMNO delegates to have the elections declared null and void. This was a very serious matter for Mahathir because if the appeal succeeded, fresh elections would have to be held and he might lose. The matter finally came before Justice Harun Hashim of the KL High Court who ruled that under the existing law, he had no choice but to declare not just the elections invalid, but the whole of UMNO an unlawful society as well. The country and, more particularly, UMNO, went into a state of shock. In most modern democracies, a political catastrophe of this magnitude would have resulted in the immediate resignation of the party's President and Prime Minister. But Mahathir did not resign. He informed the country that the Government would continue running the country. Opposition Leader Lim Kit Siang and Tunku Abdul Rahman called for a vote in Parliament to establish Mahathir's legitimacy but those calls were ignored. Mahathir then set in motion the machinery to form a new surrogate party called UMNO Baru. His opponents, however, wanted the old party revived. The eleven UMNO delegates then launched an appeal in the Supreme Court to have the 1987 elections alone declared illegal and the party not an unlawful society. Mahathir fully understood the danger to him of this pending appeal. He had to act quickly. In October 1987, he launched the notorious Operation Lalang in which at least 106 people were arrested and detained without trial under the ISA, including three very articulate critics, Opposition Leader Lim Kit Siang, political scientist Dr. Chandra Muzaffar and leading lawyer Karpal Singh. The official reason for the arrests was that a highly dangerous security situation had arisen but this has been strongly disputed as nothing more than a shameless fabrication. The broad sweep included even environmentalists and Consumer Association spokesmen. Four of the most outspoken newspapers - The Star, The Sunday Star, Watan and Sin Chew Jit Poh - had their publishing licences suspended. When, after five months, the papers were free to publish again, they were no longer the same. Mahathir's next move was to push through Parliament far-reaching amendments to the Constitution so that the Executive gained in power enormously at the expense of the Judiciary. There was general indignation at this rude behavior which shocked a good many people. The indecent haste and the fact that the amendments were made at a time when the Government's main critics were in detention - including the Opposition Leader and six vocal MPs - and outspoken newspapers were demoralized, added further to the appalling injustice of the situation. Tunku Abdul Rahman, Malaysia's beloved first Prime Minister, put it succinctly: "It was legal, but was it just?" "The Prime Minister's vile and contemptuous allegations, and the accusations leveled at the Judiciary and our judges left many shocked beyond belief. His speech which was full of venom, hate and spite with no substance whatsoever, illustrated his complete and total ignorance of the role of the Judiciary and the judicial process itself. He has indeed defiled and defaced the Constitution. It is surprising that those 142 MPs who voted in favor, after taking the oath that they would preserve, protect and defend the Constitution, had no compunction about destroying one of its basic structures." One visiting parliamentarian was astonished at the lack of public debate. In his own country, he said, such amendments would have taken years. Next, after having curbed the independence of the Judiciary, Mahathir set about destroying its integrity. This was the removal of Tun Salleh Abas as Lord President in 1988, a move which Tunku Abdul Rahman described as "the most shocking story in modern legal and judicial history." TUN SALLEH ABAS (left) was a man of humble origins - his father was a sailor and small village trader - who rose to become Lord President, the highest judge in the land and head of the Judiciary while remaining a deeply religious man. By March 1988, Mahathir's scandalous and violent public attacks on the Judiciary had so provoked the judges that Tun Salleh was obliged to call a conference. Twenty judges met in the Supreme Court one week after the debilitating and shameful Constitutional amendments were made. By unanimous agreement, a letter was drafted to the King (also the Sultan of Johore) and copied to all Sultans, expressing disquiet over various comments made by the Prime Minister. The letter was delivered on 25 March and Tun Salleh left soon after for medical treatment in the United States followed by a pilgrimage to Mecca . He had a most important duty to perform upon his return: He fixed the hearing of the crucial UMNO Eleven appeal for June and, because of its overwhelming significance, decided that a full quorum of nine Supreme Court judges should hear this. Three days later, Tun Salleh was suspended from his official capacity by the King on recommendation of the Prime Minister. In the same hour that he received the suspension letter, the Acting Lord President, Tan Sri Abdul Hamid took the UMNO Eleven case out of the calendar so that the link between the two was difficult to deny. Tun Salleh's suspension came after he refused to bow to Mahathir's pressure to either resign or retire, even though financial inducements were offered, including mention of a lucrative job in the International Development Bank in Jeddah. The initial reason given for the suspension was that the King had taken great displeasure over the letter Tun Salleh had written on behalf of all judges. 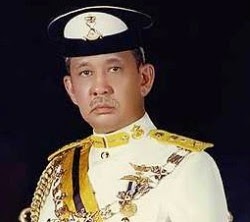 According to official records prepared by the Attorney General, the King had requested Tun Salleh's removal in an audience with the Prime Minister on the "Wednesday morning of 1st May, 1988" after the weekly Cabinet Meeting. There are serious doubts as to whether this audience actually took place. The first of May, 1988, fell on a Sunday, not Wednesday as the Attorney-General recorded. Even if the day of week were corrected, there can be no Cabinet meeting on a Sunday. That the King expressed great displeasure only on 1st May, when he had in fact received the letter on 25 March cast further doubt over this assertion. It is difficult to believe that the King wanted Tun Salleh removed purely because he had protested about the public insults directed against the entire Judiciary by the head of the Executive. In any event, royal displeasure would not be a constitutionally valid ground for dismissal. Indeed, Mahathir advised the King as much in a letter written four days after this probably fictitious audience; however, the Prime Minister went further in the same letter to say that he would investigate Tun Salleh for any evidence of misbehavior. In any event, the King did not clear up the mystery and, in an audience with Tun Salleh, actually asked the latter to step down without giving reasons although the Conference of Rulers had already asked for his reinstatement. Amazingly, Tun Salleh was suspended and a Tribunal set up to determine his fate before any formal charges were laid. The Constitution does not provide for the removal of a Lord President. While the Tribunal need not be an inappropriate means, its composition was to say the least, disgraceful. It was composed of six acting and retired judges, although the Constitution required an odd number to prevent deadlock. Of these - four from Malaysia, one from Sri Lanka and one from Singapore - only the Sri Lankan enjoyed a rank comparable to Tun Salleh's. This was contrary to the very reasonable dictum that one should be tried by one's peers rather than one's juniors. The fact that two retired Lord Presidents of Malaysia were available but not invited was glaring. There were grave conflicts of interest with three of the Malaysian judges that should have disqualified them from sitting: Tan Sri Abdul Hamid who was next in line to succeed as Lord President and who had also participated in the conference of 20 judges which resulted in the letter to the King; Tan Sri Zahir who, being also the Speaker of the Lower House, was beholden to Mahathir, the principal complainant in the matter at hand; and Tan Sri Abdul Aziz who, although a former judge, was then a practising lawyer and, more incredibly, had two suits pending against him at that time. But Tun Salleh's objections were ignored and when the Bar Council issued a statement calling for the Tribunal to be re-constituted, both the New Straits Times and The Star refused to publish it. Further, it was decided that the Tribunal would sit in closed sessions although Tun Salleh had requested a public hearing. The charges, when finally published, were manifestly absurd. Running over 12 sheets of paper, it was clear that quantity had been substituted where quality was lacking, and some of them actually related to Tun Salleh's behavior after suspension. Many of them related to his speeches and press interviews, whereby sinister meanings were imputed to various innocuous comments that he had made. To cite an instance, in a speech at the University of Malaya, he had said: 'The role of the courts is very important to bring about public order. If there is no public order there will be chaos in this country and if there is chaos, no one can feel safe.' On this basis, Tun Salleh was charged with making statements criticizing the Government which displayed prejudice and bias against the latter. Another statement of his, 'In a democratic system, the courts play a prominent role as agent of stability but they can perform this function only if judges are trusted,' resulted in the charge that he had ridiculed the Government by imputing that it did not trust the judges. These charges were doubly ludicrous in the light of Mahathir's many poisonous attacks against the Judiciary. It is not surprising that Tun Salleh, after reading this catalogue of fantasy crimes, refused to appear before what was so evidently a kangaroo court. 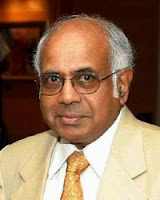 The Tribunal, after refusing representations made by Raja Aziz, Tun Salleh's leading counsel, that it had no constitutional validity to sit, chose instead to proceed so hastily that it wound up deliberations, including the examination of witnesses with just four hours work. As it prepared to issue its Report, Tun Salleh's lawyers sought an urgent stay of proceedings in the High Court. This would normally be granted immediately at the least possibility that an injustice may be about to be done but, here, events turned into utter farce. Instead of immediately reaching a decision as expected, the presiding judge, Datuk Ajaib Singh, after the court had been in languorous session the whole day that Friday, adjourned hearings for 9.30 am the next day. On Saturday however, the judge emerged in court only at 11.50 am and, even then, postponed hearings again for the Monday! In desperation, Tun Salleh's lawyers, knowing that the Tribunal could easily release its Report before then, sought the assistance of Supreme Court judge, Tan Sri Wan Suleiman, in his Chambers. The latter agreed to hear them in open court in half an hour's time and called a quorum of all remaining Supreme Court, one of whom, Tan Sri Hashim Yeop, refused to sit. The soap opera reached an apogee of ridiculousness when Tan Sri Abdul Hamid, head of the Tribunal and Acting Lord President, gave orders for the doors of Supreme Court to be locked and for the seal of the Supreme Court to be secreted away! Undeterred, the five Supreme Court judges ordered the policeman on duty to open the door forthwith. After less than half an hour, the Court ordered the Tribunal not to submit any recommendation, report or advice to the King. Tun Salleh's lawyers were typing the Order to serve personally to the Tribunal at Parliament House when news arrived that the gates of Parliament House had been locked! At this point, Justice Wan Suleiman rose to the occasion and, calling the office of the Inspector General of Police, told a senior officer that any impediment to serving the Order would constitute contempt of court. The gates of Parliament swung open and, at 4pm, Raja Aziz and his team served the Order to the Tribunal members who were found to be still hard at work on a word-processor that Saturday afternoon. All six members accepted service without complaint. It would appear that justice had at last prevailed but, four days later; all five Supreme Court judges were suspended. 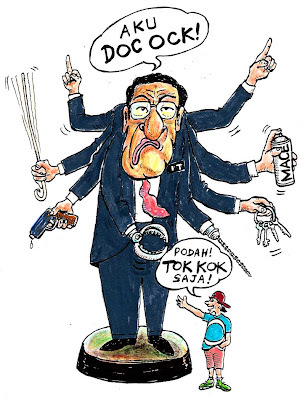 Almost every rule that was broken to suspend Tun Salleh was broken again to suspend them. The prohibition order they had made was revoked within days. A second Tribunal eventually reinstated three of the judge: Tan Sri Azmi Kamaruddin, Tan Sri Eusoff Abdoolcader and Tan Sri Wan Hamzah but Tan Sri Wan Suleiman and Datuk George Edward Seah were removed from office. The UMNO Eleven case was quickly dismissed. The removal of Tun Salleh also saw the resignation of Deputy PM Datuk Musa Hitam who, according to popular wisdom, could no longer stomach Mahathir's ways. NOTE: These ignominious events took place 26 years ago, when many of the present generation may have been too young to understand the ruinous long-term consequences of Mahathir's brazen attacks on Judicial independence and integrity. I've blogged this excerpt from May Day For Justice to refresh memories and to provide some insight to the younger generation. Now they can see for themselves what a manipulative creature we had as Prime Minister between 1981 and 2003. Some say Mahathir did a lot of good for Malaysia by putting the nation on the world map with his ambitious industrialization program called Wawasan 2020. In truth what Mahathir actually did was destroy the country singlehandedly with his shallow and ill-conceived Cyclopean vision. The Malays sold their souls to the Mamak for a meagre handout or two with which to buy cheesy chandeliers for their plastic palaces. Now many have awakened! Only the selfish or brainless remain supportive of Mahathir. The cruel, deceitful and destructive "UMNO Baru" culture Mahathir spawned has to go before Malaysia is totally doomed to pathological self-delusion. Unfortunately, although Mahathir rants and raves against his hand-picked successor, Abdullah Ahmad Badawi, the present-day leadership of UMNO Baru continues to uphold Mahathir's legacy of lies and unprincipled power play.